Firstly, a Virtual Network Function (VNF) needs hardware, whether that is in on-premise servers or in the cloud. There may be some tuning and optimization required to achieve the necessary performance. The second integration point is the Management and Orchestration (MANO) framework, responsible for loading VNF software images onto the right infrastructure and managing scaling in line with demand. The third integration point is with the Operations Support System (OSS), to enable the service delivered by the VNF to be managed. The process of integrating and tuning the VNF across all of these touchpoints can be complex. Working with Systems Integrators (SIs): Many CoSPs will find they don't have the skills required to do all of the integration work themselves. Even those that do may choose to lower risk by working with partners who can bring the experience they've gained through successful deployments on other networks. Among other things, a systems integrator can help with integrating VNF products into MANO and the NFV Infrastructure (NFVI), implementing NFV deployment business policies in MANO, and integrating the NFV domain with the existing OSS and FCAPS (Fault, Configuration, Accounting, Performance, Security systems). SIs can also help to audit the openness of an implementation, to ensure that it is as future-proof as possible. 2. Choosing verified hardware solutions: When using Commercial Off-The-Shelf (COTS) servers, there is a huge range of options available. Not all servers can support the line rate performance that NFV requires, so choosing servers that are verified for use in NFV applications can significantly reduce your risk. Intel® Select Solutions for NFVI are reference architectures for standard COTS servers, including optimal hardware configurations for use in NFV. CoSPs that adopt these architectures can cut their time to market and be confident that their hardware will deliver the performance and stability required. The Open Platform for NFV (OPNFV) creates a proven NFV reference platform, which is documented as a release every six months. OPNFV also has a verification program to check the compliance of vendors' products with the releases. 3. Adopt microservices: All of the software components that make up the system will have their own release and upgrade cycles, which further increases complexity. Monolithic NFV applications have therefore evolved towards disaggregation into microservices, where the application is split into smaller parts that work cooperatively. This minimizes the risk of a software upgrade, because microservices can be updated independently, and only a small part of the application needs to be touched with each update. Live traffic can be instantly switched between the old and new versions. 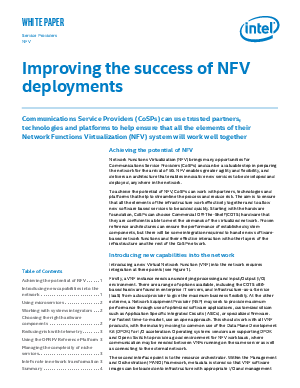 To find out more, download the white paper Improving the Success of NFV Deployments.